Hillary Clinton appears in the top ten most admired women in ten of the countries polled, including India (4th), Nigeria (5th), France (8th) and Britain (9th). In addition to being America's most admired woman, she is the second most admired woman in China. 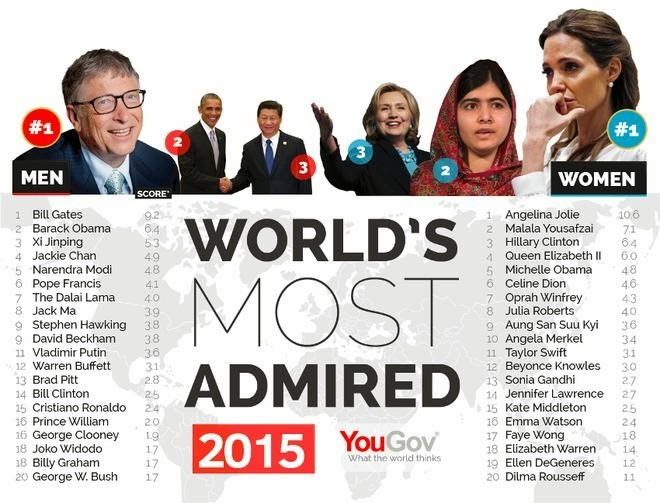 Even in Russia the former American Secretary of State is the 15th most admired woman. As former American Secretary of State she arguably had a greater global profile than any other American politician except Barack Obama, though John Kerry is absent from the list of most admired people, either in the US or internationally.